Presenter is a Windows based program for controlling various types of media on three separate outputs, typically one or more large screens using video projectors. It’s the ideal choice for churches, schools, community groups or commercial businesses wanting a more practical alternative to juggling between MS PowerPoint, Windows Media Player, Adobe Flash and other presentation applications at the same time. Presenter provides an integrated media solution allowing items to be queued in a running sheet. Settings such as loop mode, volume, mark in/out points are preserved individually for each item. Presenter is a free Church presentation software to project worship songs, Bible verses and custom slides with images, audio/video etc. 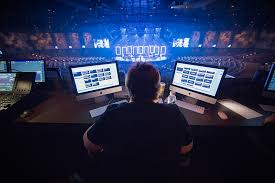 If you’re looking for a reliable free option for your worship software requirements, you should take a serious look at Presenter. A fast song search feature is also available. Presenter can display up to two translations at the same time—great for multilingual services! Presenter can be installed on Windows, Mac and Linux machines. Four (4) separate outputs2: Control + 3 displays. Video clips with text overlay. Live video capture feed with text overlay. New text style configuration, including semi-transparent regions (as seen under broadcast TV captions). Spell checker. Included dictionaries: US, UK, Australian, KJV + many more available for download. New facility for complete control of images. Background image support at the song AND individual page level. Output splitting of text and images E.g. Display slides in two languages on separate monitors in a single action. Slide transition effects (fade, wipe, roll, etc.). Fold back clock, countdown timer and media progress timer. Loading and saving running sheets with user timestamp and description. Native CCLI Song Select file format support.No risk: presenter is free from malware attacks. Easy to learn and Easy to teach: Even though you are not a professional. Saves cost: This is one of the most beautiful features of all, because the technology in presenter does not require any service or hidden charge of any sort at all. Finally your in control of what the audience are viewing. Intel or AMD Pentium processor sufficient to run PowerPoint, video clips and/or DVDs as required. Examples: Pentium 2.8GHz SP, Core 2 Duo 2.4GHz, PM 1.8GHz, PM 965 Express. Dual-head desktop or laptop with primary monitors 1024 X 768. Windows Vista, 7, 8 or 10*. Dual or quad core processor (Intel or AMD). Graphics adaptor supporting DirectX9 or higher (eg. nVidia 7000 chipset). Windows 7, 8 or 10*. MS Office/PowerPoint 2003 or above (PPTX format requires PowerPoint 2007 or above). Windows XP SP2 does work, but is no longer supported. Windows 10 ‘N’ edition requires the media pack. It suports custom alerts, Bible import through CSV files, CCLI/SongSelect integration, PowerPoint file import etc. OpenLP can import songs from a wide variety of sources like other presentation software. Support for video background is under development. However, you can use a transparent theme as a workaround for now until this feature rolls out. Ability to add backing tracks to songs. OpenLP is a fantastic option for anyone looking for a free and feature-packed church or meeting presentation software.